WebManager Contacts are where all contacts are managed. The Active Contacts and Archived Contacts screens list the contacts generated from messages you have received through your website, eBay auction listings, and any other sources, and contacts you have added manually to the system. At the top of the screen are buttons you can use to cycle through your contacts if you have more than can fit on the current page, or you can click on the page information to get a list of pages you can jump directly to. You can also change your display filter (to display only a certain lead source, for example) and your sort order (so you can sort by first name or email address, for example). You can search for a particular first name, last name, email address, phone, street address, city, state, or zip code. Each contact listed will display an envelope indicating whether you have viewed the contact ( ) or not yet ( ), the name of the contact, the address of the contact, and the date the contact was created. Moving your mouse over a contact row will expand additional information, including the email address of the contact, the contact’s phone number, the source of the contact, and the first few lines of the last note entered for the contact. Unreviewed contacts will be highlighted, and will display a closed envelope ( ). Reviewed contacts will display an opened envelope ( ). 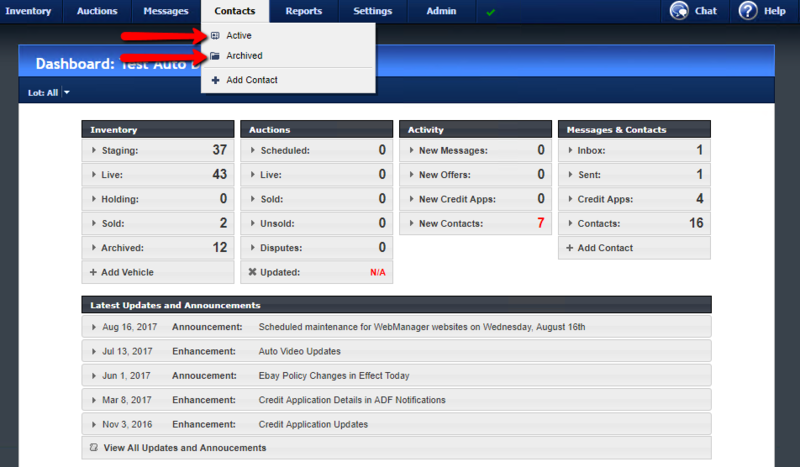 You can tag contacts for various actions by checking the box at the beginning of the contact row, or clicking on Check All to select all contacts on the page. Click on High Priority to mark tagged contacts to make high priority leads visually distinctive, or click on Low Priority to remove the mark. Click on Archive if you want to archive contacts and be able to refer to them later, or click on Restore to move the contact back to your active contacts. Click on Delete to permanently remove selected contacts from the system. To view the Contact Details, click on the contact’s name.